Looking for a cake related template that will Wow your visitors? 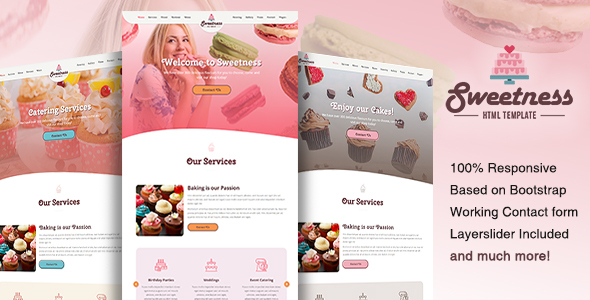 Sweetness is a fully responsive One Page HTML5 made for any Cake / Pastries related websites. The template includes many fun elements that are very easy to edit. It’s built on the Bootstrap Framework which has a powerful option that makes the theme completely customizable. It Includes 5 ready made Color Skins, but you can make your own colour scheme yourself easily!